Cheese analogues (more widely known as cheese alternatives) are products used as culinary replacements for cheese, but have properties such as different melting points or lower costs that make them attractive to businesses. Yellow colour, aromatic, rich milk taste and smell without foreign odour. 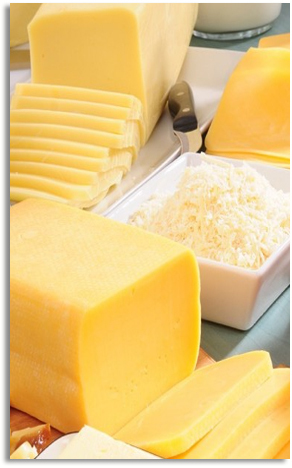 Industrial processed cheese, convenience food production (especially pizza), retail sector, catering and hotel industry. High fat, protein and minerals content, low lactose, long shelf life, ease of transportation. Store in a dry, cool place at max. 7°C. Transport chilled. Product temperature max. 15°C. Advised temperature for grating, slicing etc. preferably 4-6°C, product has 12 – 18 months shelf life in the original packaging. 15kg block in a blue flow pack packaging. Blocks packed in a pallet carton with PE-bag inside (100*120cm ). Approximately 800kg per carton.